WAWI - Dr. Walter Müller - Packed 24 & 70 per Cs. • We beat all prices. • Free freight on every case. • Free German T-Shirt with every 240 Pcs. (5 maximum). One of my fondest Christmas memories is of an Advent Calendar! Each day before Christmas we got to open one window and reveal what was behind the little door. How much more profound would my memory be, if the little door of the Advent Calendar revealed a three dimensional piece of some of the finest German Chocolate. 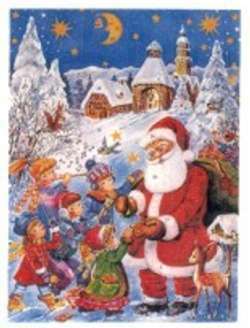 The WAWI chocolate Advent Calendar by Dr. Walter Muller is our school fundraising favorite of all time bar none! Each day's door reveals a delicious finely made German Chocolate treat that will help make memories that last a lifetime. A few months before Christmas season the WAWI chocolate Advent Calendars are the quickest way to raise funds because of their seasonal popularity and the fact that they can be marked up a little more than the rest of the candy we sell for fundraising.